Lobster shells from the tail, claws, knuckles, and legs are full of flavor and, when very gently simmered in water, yield a clean-tasting, briny stock. Seasoned with mirepoix, sherry, and herbs, this classic bisque is thickened with fragrant jasmine rice. 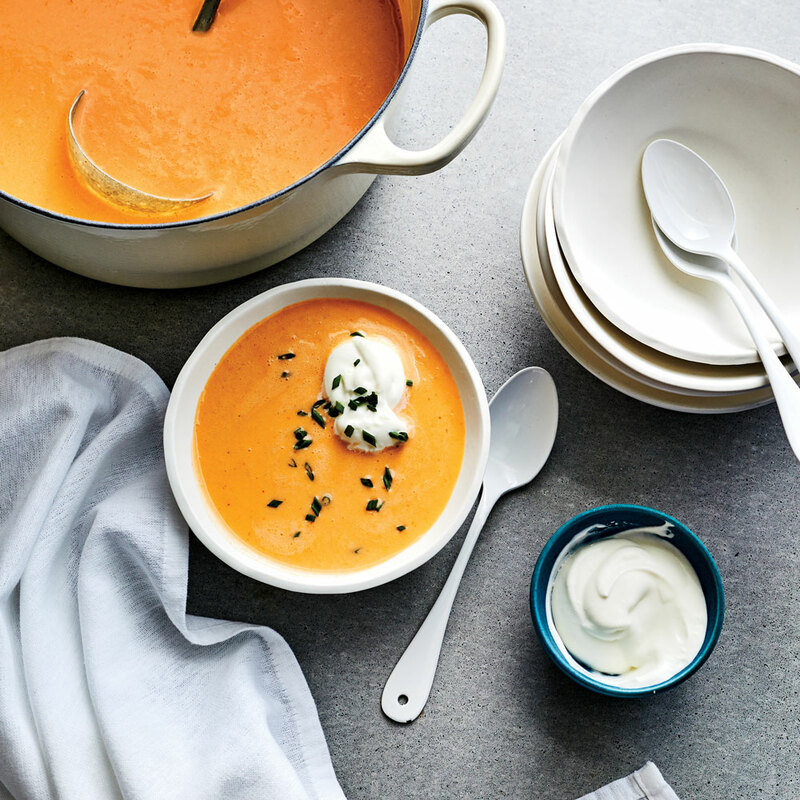 Serve it hot or cold for a knockout lunch or simple supper. Combine lobster shells and 12 cups water in a large stockpot. Bring to a boil over medium-high. Reduce heat to low, and simmer very gently 45 minutes. Pour stock through a fine wire-mesh strainer into a large bowl, and discard shells. Melt butter in a large saucepan or clean stockpot over medium. Add onion and celery, and cook, stirring occasionally, until very soft and translucent, about 15 minutes. Stir in tomato paste, and cook, stirring often, until brick red in color, about 2 minutes. Add sherry; increase heat to high, and bring to a boil. Stir in rice, thyme, bay leaves, black pepper, and 2 teaspoons salt. Add lobster stock, and bring to a simmer. Reduce heat to medium-low, and simmer until rice is very soft, about 25 minutes. Remove and discard bay leaves. Remove from heat, and let stand 15 minutes. Place one-third of mixture in a blender. Remove center piece of blender lid (to allow steam to escape); secure lid on blender, and place a clean towel over opening in lid. Process until very smooth, about 1 minute. Transfer mixture to a large saucepan. Repeat procedure 2 times with remaining bisque. If serving bisque hot, reheat over medium-low, stirring, until hot. If serving bisque cold, chill until cold. When ready to serve, stir lemon juice, cayenne, and 1 cup cream into bisque. Place remaining 1/2 cup cream in a chilled bowl, and whisk until soft peaks form. Stir remaining 1 /4 teaspoon salt into whipped cream. Season bisque with salt, lemon juice, and cayenne to taste. Divide bisque among 8 bowls, and top with whipped cream and chives. Bisque may be made through step 3 up to 2 days ahead. Keep chilled until ready to serve.